Prior to placing your order, please alert the manager to any allergens which may be of concern to you. 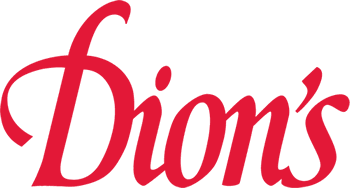 Although efforts are made to avoid cross-contact of allergens, Dion's Pizza does not guarantee that cross-contact with allergens will not occur. Any food in our establishment may come into contact with surfaces or utensils that have previously contacted wheat, dairy, gluten, fish, eggs, soybeans, tree nuts, or peanuts. The allergen declarations displayed are based solely on the information our suppliers provide. Therefore, please check this site often to ensure you are receiving accurate and current information. Please note that these nutrition values are estimated based on our standard serving portions. As food servings may have a slight variance each time you visit, please expect these values to be within 10% +/- of your actual meal. If you have any questions about our nutrition calculator, please contact Nutritionix.